Part of being a ski race dad is traveling all over the state. It’s not my favorite thing, but it’s part of the game. I have to admit it’s great to experience new ski areas. On our race trip to Hunter this past weekend, my son’s coach decided to train in the Catskills on Friday. 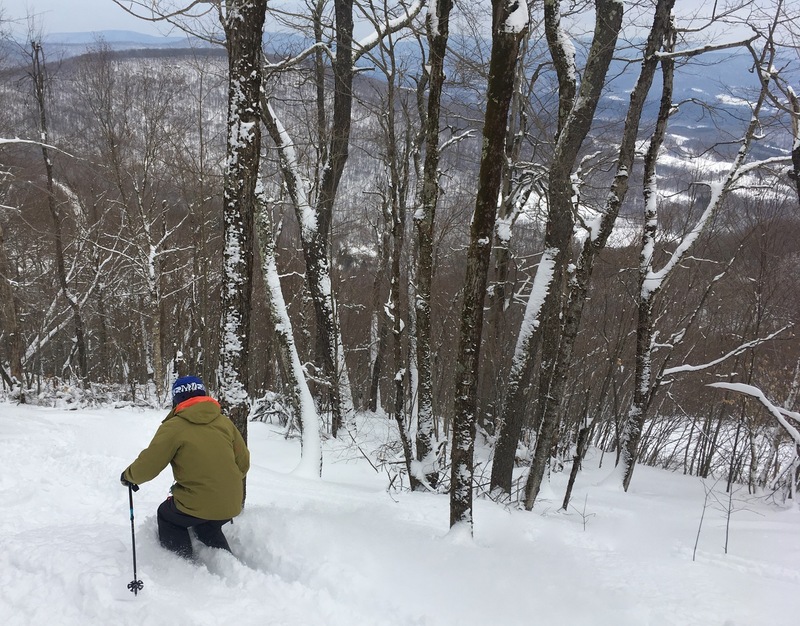 My wife agreed to come down in a separate car, freeing me up to ski Plattekill and discover why NYSB skiers love the place so much. I had a pleasant drive from Windham where we stayed, taking in the scenic farms and winding headwaters of the Delaware River. I was the fourth car in the lot and parked maybe 50 yards from the door. I met forum member frk driving in; we quickly connected and booted up. We were on the second chair at opening. My first true view of Plattekill spread out in front me; a thousand feet of continuous, steep vert. It was bigger than I expected, and I was stoked. About 5 inches of fresh dry powder had fallen since the mountain had been groomed. At the top — before I could buckle my boots — frk was gone. I headed straight down under the double chair snagging first tracks on Plunge. I skied a couple of nicely frosted groomers before I found frk again. He led me off into a mountain bike trail that dropped us into some really tight trees with uncut knee-deep pow. A Gore skier, frk is a bit of a lumberjack, and will apparently ski anything, so I had to monitor our lines and make my own decisions. Frk and I separated and reconnected a few times more during the morning. 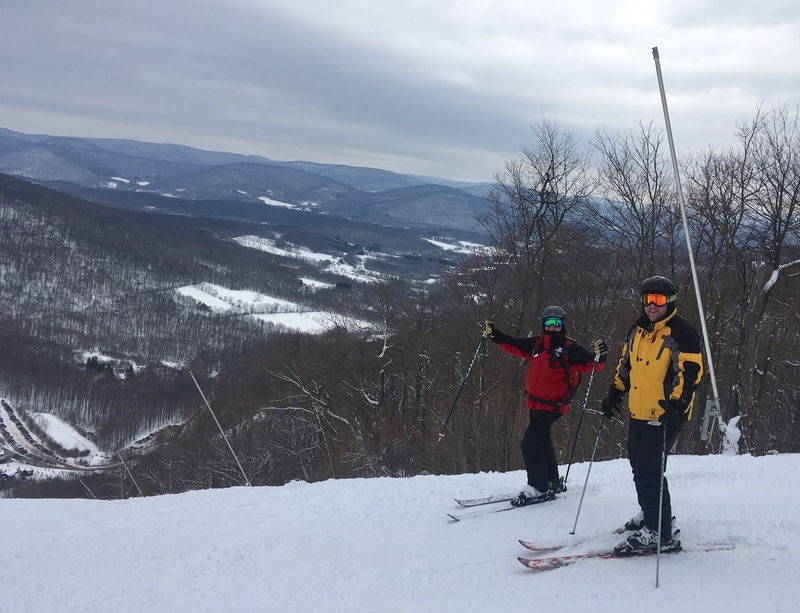 The layout at Plattekill, with both lifts rising out of the same base area, seems to make finding your buddies easy compared to some other ski areas. Around 10:30 frk and I ran into Brownski who showed us a the new glade that had been cut by the NYSB team in October. I was stunned to find it untouched at this time of the morning. Frk dropped in and I quickly followed. 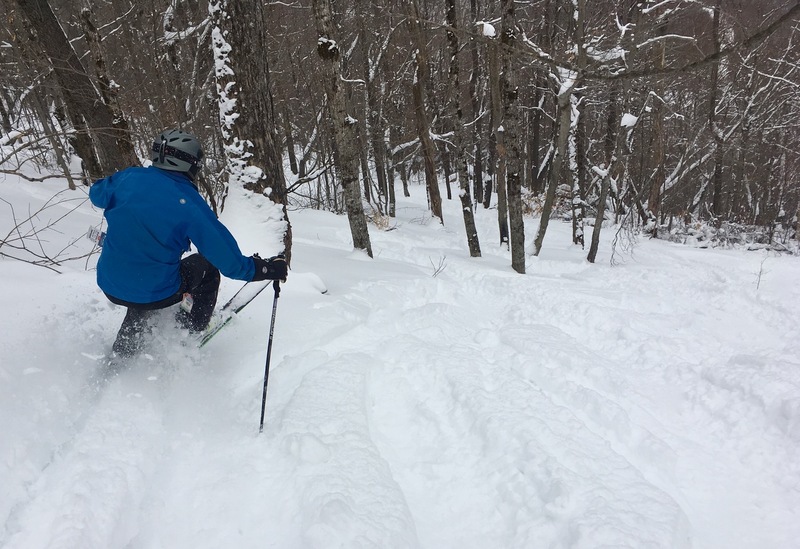 It was the best powder I skied this year, including my recent day in The Slides. The snow was dense enough to cover the stumps and rocks and the glade flowed remarkably well. We did sustain some battle damage to our skis from the lower section of the run, so we went back up and skied another untracked line on the top section. The second run was even better than the first as we knew where we could be aggressive. We explored the triple chair for a couple runs and then headed in for a very good lunch. 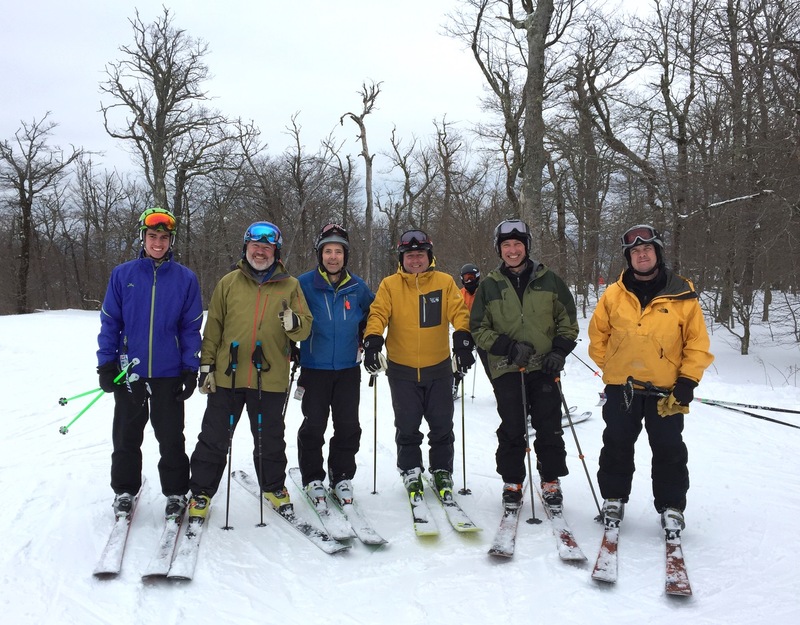 Afterwards we ran into Ethan and Marcski, grabbed a group photo and skied the new glade again. Later in the afternoon, the temps seemed to rise and the snow got sticky, so frk and I had a beer together in the bar and called it a day. I had to head back to meet my family post-race. On the way out, I thanked Laszlo for his hospitality and told him how much I enjoyed his mountain. I think I got in 16 runs. I know I had a great time meeting and chatting with the NYSkiBlog crew. The talk around the base area was that the lift lines were the longest anyone could ever recall seeing on the double chair, and they were maybe three minutes long. That chair almost never stops as it serves strong skiers. The joke was that I contributed to the crowds by encouraging the big Plattekill meetup. I think mother nature and 20 inches of snow had something to do with it too. I’d heard that the lift lines at some of the other hills were long on Saturday. As I head back to meet up with my family, I was smiling from ear-to-ear thinking about my first great day at this gem in the Catskills. Thank’s for coming to Plattekill Coach Z. I’m glad you enjoyed the day, you picked a good one. The lift lines this weekend, as well as the long line of cars down the road is what we call the back yard effect. 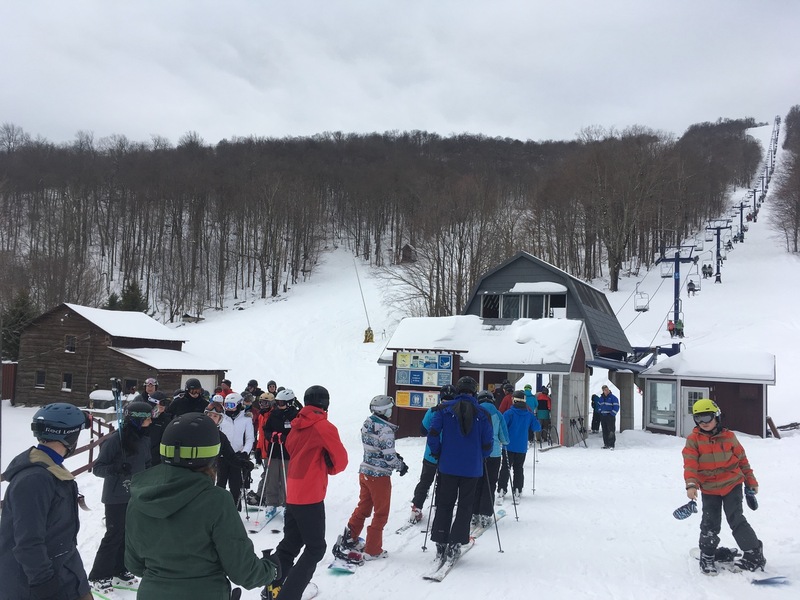 When it snows downstate, and North Jersey, everyone seems to get excited to go skiing and skier traffic in the Catskills nearly doubles. It’s awesome to watch. 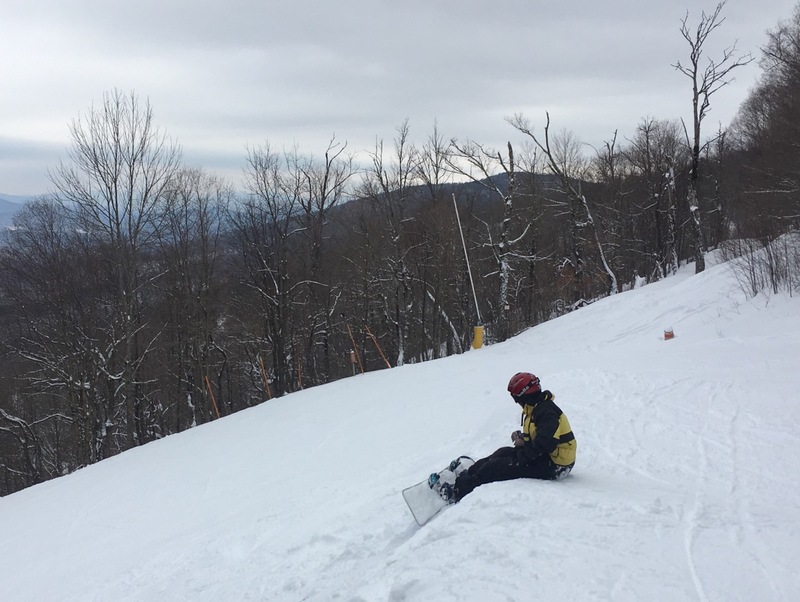 The great thing is Plattekill’s lifts are just slow enough, that you always seem to have the mountain to yourself. Hey Coach Z, it was nice meeting you and taking you down Blockbuster before my 10am lineup. Awesome meeting up with you and the rest of the crew, coach. Hope we meet again some time. Doesn’t seem right travelin South to ski but Plattie never disappoints. Glad you got to see it for yourself. Looks like a good time, glad you hit it right for a first visit (though there’s never a bad day there!). So pumped you had a good time Coach! Hey is that JUNIOR lurking in the background? So glad you spent a day at Platty. Looks like a typical great day. I hope to be there next time you come. The alternate title for this post I gave to Harv was “the most fun you can have with 1100 vert”. Platty certainly skis the biggest I’ve experienced in any ski area less than 2000 vert. Bigger than some competitors. I loved the whole vibe and experience and hope to get back soon. I was there the day before for my first time and it was awesome! I’ll be back again! woof – looks like a party! Heck Yeah Coach! 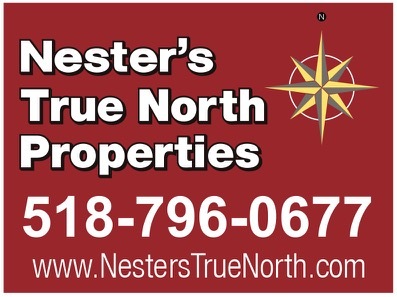 Great report/story, I’m stoked you got to check it out. Coach. It was a pleasure meeting and skiing with you. So glad you got a great first day. I think if anyone didn’t love Plattekill this weekend, they just don’t like skiing. Coach Z you’ll need to come back on a Powder Daize… simply amazing!! !